Dubai, UAE, April 01, 2019: Sharjah Equestrian & Racing Club's Salim Khamis Al Suwaidi and his horse 'Espresso' won the 21st Emirates Show Jumping Championship. This competition showcased 15 classes over three days at the Emirates Equestrian Centre in Dubai, under the supervision of the UAE Equestrian and Racing Federation (UAEERF) with Longines as the title sponsor, Official Time Keeper and presenting partner of the Emirates Longines Show Jumping league competitions. The championship started last Thursday and concluded on Saturday, before all eyes and horse racing crowds went to the Meydan to watch the Dubai World Cup 2019. The Emirates Championship celebrates UAE riders from all categories approved by the UAE Equestrian and Racing Federation (UAEERF) who participated in the Emirates Longines Show Jumping League’s national and international competitions during the UAE’s show jumping season. Children, Juniors, Young Riders, as well as Division 1 & 2 riders, rode in their respective classes with each category riding in three competitions - one on each day of the championship. The results are judged according to the special rules for the championship and the riders' results are carried over to the championship’s final day of competitions. The championship carried a total purse of AED 400,000, which was distributed amongst winning riders. Sheikh Jamal bin Nasser Al Nuaimi attended the championship competitions and awarded the winners of Division 1, while Hussam Zummit, representative of the UAEERF and supervised the riders' performance. Hamad Al Shamsi, Director of the Emirates Equestrian Centre in Dubai, and Mohammed Ibrahim Al-Nakhi, Vice-Chairman of the Show Jumping Committee at the UAEERF also took part in presenting the prizes to the riders. The Ground Jury Committee was presided by Khalil Ibrahim with the assistance of several international judges. The courses were designed and implemented on the arena by the German Course Designer Volker Smidth and the championship arenas were supervised by Ali Muhajer. Salim Khamis Al Suwaidi and his 10 year-old horse 'Espresso' from the Sharjah Equestrian & Racing Club won the final Two Rounds not Against the clock class with jumps placed at 150cm. This was another title added to Al Suwaidi's great record with 'Espresso', as he won a number of international show jumping championships during the season. He also holds the title of winner of the Emirates Championship in the Division 1 category with his spectacular horse 'Feline S', which he won back in 2017. Al Suwaidi came in first with a score of (3.04) penalty points in the three rounds. Sheikha Latifah Al Maktoum came in second on her horse 'Cobolt 8' with a score of (3.52) penalty points, and Sharjah Equestrian & Racing Club's rider Hamad Ali Al Kirbi and 'Uxmal D’ysieux' came in third with a score of (4) penalty points. The Division 2 Riders’ competitions were concluded with a One Round with Jump-Off class where the course was designed with obstacles at (120cm) height. Two riders succeeded in completing the jump-off round without faults. In first place came Muftah Jawhar Al Dhahiri and 'Bell Bottom Blues' from Mandara Equestrian Club, who completed the jump-off in (42.74) seconds, winning him the Division 2 title. Sharjah Equestrian & Racing Club's Moh'd Yousuf Baker and his horse 'Foss' came in second with a time of (45.14) seconds. 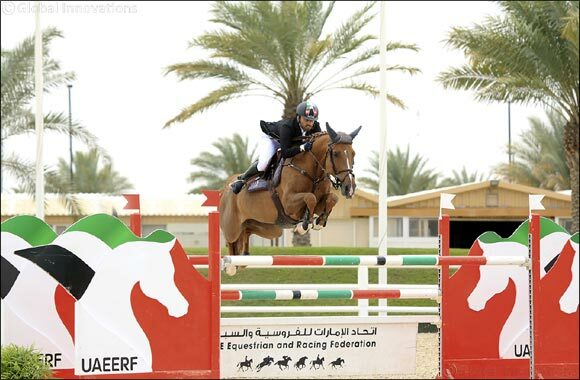 Mohammed Abdullah Ketait and his horse 'Super Trooper' from the Emirates Equestrian Centre completed the jump-off in (42.45) seconds with a score of (4) penalty points, landing him in third. Al Shira'aa Stables' Humaid Abdullah Al Muhairi and 'Corando 11' won young riders’ category after scoring a total of (4.55) penalty points during the three classes which concluded with a Two Rounds not Against the clock competition with jumps placed at a height of (140cm). In second place came his fellow club member Mohamed Omran Al Owais riding 'Caravelli' with a score of (6.57) penalty points. This indicates that competing for the young riders’ title was exclusively between Al Shira'aa Stables riders by a margin of penalty points. In third came Saeed Mohamed Al Maazmi and his horse 'Al Commandos' from the Sharjah Equestrian & Racing Club who scored (12) penalty points. Omar Abdul Aziz Al Marzooqi continued his outstanding performance in the show jumping competitions in the Junior riders’ category during the Emirates Championship by winning the title with his horse, 'Coral Beach', from Al Shira'aa Stables. Al Marzooqi, winner of the Silver Medal at the Youth Olympic Games Buenos Aires in Argentina 2018, succeeded in completing the Juniors’ category rounds with a score of only (4) penalty points all of which were committed in the jump-off round of the category's final competition. The course for this competition was designed with jumps at (130cm) height. Al Shira'aa Stables' riders carried on with an impressive performance, when Mayed Ahmed Ahli and 'Brazoria De Semilly' came in second with a score of (6.09) penalty points. Emirates Heritage Club's Abdulla Yousef Al Jneibi and his horse 'Vitaline' came in third with a score of (10.23) penalty points. The second class for the children’s category, where the course was designed with obstacles at (110cm) height, was a One Round with Jump-Off competition. Al Safinat Stables' Eisa Omran Al Owais and 'Code Of Honour' won the title by completing the first class with jumps at (105cm) height without accuring any faults. In the second round, he completed the jump-off without faults, scoring a time of (39.49) seconds, followed by riders from the Sharjah Equestrian & Racing Club who placed in second and thid respectively - Abdullah Hamad Al Kirbi and his horse 'Lover Des Patis' came in second with a score of (4) penalty points, with a time of (39.29) seconds, with Humaid Dherar Rashid and 'Obora's Samuray' coming in third. Two classes were open to riders of all categories. 21 riders participated in the first class, nine of which rode without faults. Salim Ahmed Al Suwaidi and 'Snapp Jack' came in 1st place. The 2nd Open Class – a Two Phases competition - witnessed the participation of 18 riders. This competition concluded with Rashed Moh'd Al Romaithi and 'Ajial' from the Abu Dhabi Equestrian Club coming in first by completing the second phase in (36.31) seconds. Omar Al Marzooqi and 'Concordia' came in second with Al Romaithi riding his second horse, ‘Gibsy’ to secure third place.